Double level house. We only rent the apartment downstairs. 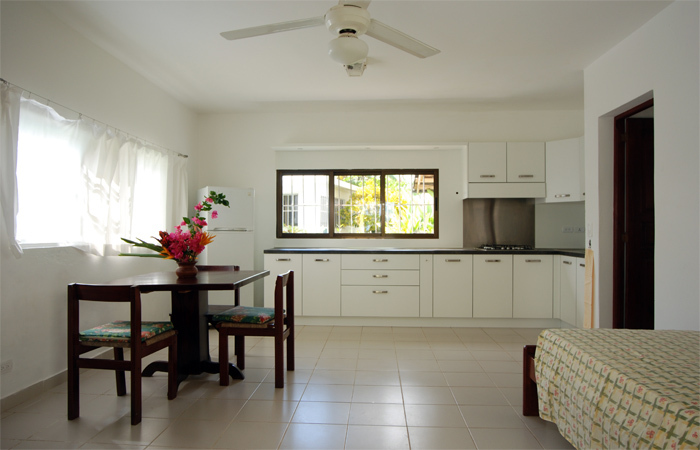 The apartment is ideal for one couple or a family with one child. The bedroom equipped with two single beds, which can also be used as double beds, a big wardrobe as well as a sideboard, got a direct entry to the separate bathroom with big shower, sink and toilet. The living room with integrated kitchen with stove, sink, big fridge, dining table and a single bed offers enough space for a third person. Bedroom and living room got ceiling fans which are sufficient in the high season. The big covered terrace with partial view to the sea and the beach promenade disposes about a table and chairs to relax. Distance to the sea: 40 meters. Electricity 110 and 220 volts, American plugs. The owners are only staying upstairs for vacations.